The NHL playoffs are over for both the Tampa Bay Lightning and Pittsburgh Penguins, meaning they’ll have to wait until next season to enact any revenge. The Lightning experienced arguably the worst collapse in history when they were swept out of the first round after recording a historic 62-win season, while Sidney Crosby and the Penguins weren’t able to call on any postseason magic to overcome Barry Trotz and the New York Islanders. As teams are eliminated there will be minor moves made to clean up rosters, and we’ll be here to keep track of all of them. The Lightning have sent Cameron Gaunce back to the AHL to help the Syracuse Crunch, a notable move for the minor league club. Gaunce recorded 46 points in 59 games with the Crunch this season and will return to run a powerplay in the Calder Cup playoffs. The Crunch start their first-round series against the Belleville Senators on Friday evening. Zac Dalpe is similarly on his way down to the AHL, but it’s not clear if he’ll stay there for very long. The 29-year old forward will help the Cleveland Monsters in their upcoming playoff series—also starting on Friday evening—but could potentially come back up to help the Blue Jackets in the second round. Like the Dallas Stars and Winnipeg Jets this morning, the Calgary Flames have recalled their “Black Aces” for the remainder of the playoffs. Spencer Foo, Ryan Lomberg, Glenn Gawdin, Tyler Graovac, Matthew Phillips, Buddy Robinson, Curtis Lazar, Marcus Hogstrom, Rinat Valiev and Tyler Parsons are all heading up to the big club to skate in practices and get a glimpse of the NHL playoffs. If there were a list of the most important nights on the NHL schedule, this evening may rank pretty high. With ten games on tap there are key matchups all across the league, including a massive battle between the Pittsburgh Penguins and Carolina Hurricanes. Both teams are playing well and have actually started to chase down the top teams in the Metropolitan Division, coming into tonight’s action just three and six points behind the New York Islanders respectively. As teams prepare for all the big showdowns tonight, we’ll be here keeping track of all the minor moves. The Tampa Bay Lightning have sent Cameron Gaunce back to the minor leagues after serving as insurance last night. With Dan Girardi and Anton Stralman continuing their recovery, the team needed an extra defenseman just in case. Gaunce will return to the AHL where he has had an outstanding season and wait for his next opportunity at the NHL level. Justin Bailey has been recalled by the Philadelphia Flyers once again, a normal occurrence lately for the young forward. Bailey has played seven games for the Flyers since being acquired earlier this season, but is still looking for his first point in the black and orange. With ten games left in the regular season for most teams in the NHL, every match is incredibly important for those looking for a playoff spot. The schedule has just four games for tonight, but there are still some key matchups. The Arizona Coyotes try to keep their season alive against the league’s top team, while the Vegas Golden Knights and San Jose Sharks face off in a potential first round preview. As teams prepare for the action, we’ll be here keeping track of all the minor moves. Cameron Gaunce has been recalled by the Tampa Bay Lightning, who are currently still without Dan Girardi and Anton Stralman. Gaunce likely won’t get into the lineup tonight—instead serving as insurance—but is certainly having a strong enough season to warrant an NHL stint. The 28-year old defenseman has 42 points in 56 games for the Syracuse Crunch, easily a career high. The Boston Bruins have recalled Connor Clifton and Paul Carey from the AHL under emergency conditions, and had them both on the ice today at practice. Clifton was skating with Steven Kampfer on the third pairing, while Carey was working as an extra forward. The Bruins take on the New York Islanders tomorrow night in a matchup of potential Eastern Conference playoff teams, and are working to get healthy again before the postseason begins. The Calgary Flames have recalled Curtis Lazar from Stockton, bringing up the former top prospect after a strong season in the AHL. Lazar has 37 points in 49 games for the Heat this season but has failed to get into a single NHL game. Lukas Radil and Jacob Middleton are on their way back to the San Jose Sharks, back up after just a few days in the AHL. The pair were sent down on Friday to stay fresh but will be back up to help the team as they prepare for the Golden Knights tonight. Speaking of quick turnarounds, Justin Bailey is on his way back to the minor leagues. The Philadelphia Flyers forward has been involved in almost daily transactions all month, bouncing back and forth between the NHL and AHL. The NHL is unusually active for a Friday night, with six games on the schedule including the Hall of Fame game in Toronto. The New Jersey Devils will take part in the game honoring the new inductees which include Martin Brodeur, Martin St. Louis, Willie O’Ree, Alexander Yakushev, Jayna Hefford and Gary Bettman. As the league prepares to induct some of the greatest to play the game, we’ll keep track on all the more minor moves around the league. The Tampa Bay Lightning have reassigned Cameron Gaunce to the Syracuse Crunch of the AHL after almost two weeks with the team. Gaunce never did suit up for the Lightning, and will now try to get back into game shape with the Crunch. The 28-year old defenseman will likely be the extra man called up several times this season, though his playing time is expected to be restricted to mostly the minor leagues. Given John Klingberg’s injury, the Dallas Stars have recalled defenseman Joel Hanley from the minor leagues. They’ve also moved both Klingberg and Alexander Radulov to injured reserve, though the latter’s stint is retroactive to October 30th. Hanley has five points in 11 AHL games this season, and will try to force his way into the NHL lineup now that they’re missing a big part of their blue line for at least a month. The Ottawa Senators have returned Erik Burgdoerfer to the minor leagues, even as they start their short two-game road trip in Florida. Burgdoerfer has played in just a single game with Ottawa this season, and will spend most of the year in the minor leagues. Jesper Bratt has been officially activated by the Devils and should be in the lineup tonight, a move that needed no corresponding transaction given that Eddie Lack cleared waivers and can remain in the minor leagues. Lack had been on conditioning loan to the Binghamton Devils and will now stay there on assignment. The Devils have sent Kurtis Gabriel back to the AHL though, in order to activate Stefan Noesen for tonight’s game. The Anaheim Ducks have returned a pair of young players to the AHL. The team announced that forward Sam Carrick and defenseman Andy Welinski have been reassigned to the San Diego Gulls. Both players have logged considerable time in the minors already this season, but have only suited up for eight games total for the Ducks. One of those aforementioned injuries last night was sustained by the Ottawa Senators’ Zack Smith, who sustained a facial fracture in a loss to the Colorado Avalanche. With the Sens currently on a road trip and set to face the Vegas Golden Knights tomorrow, the team has worked quickly to replace Smith’s roster spot. The team announced the recall of forward Jack Rodewald from their AHL affiliate in Belleville. Rodewald skated in four games with Ottawa last season and was held scoreless, but is off to a hot start in the minors with seven points in eight games. The Edmonton Oilers have activated defenseman Matt Benning from the injured reserve. Benning was placed on the IR last week with an undisclosed injury and has returned as soon as possible from the mysterious ailment. In a corresponding move, the Oilers have returned Kevin Gravel to the AHL’s Bakersfield Condors. Gravel had been called up to replace Benning, but saw very limited ice time in two games with Edmonton. The free agent addition will have to return to the minors, where he had played well, and continue to show that he is worthy of an NHL roster spot. Veteran forward Ryan White has signed a PTO with the AHL’s Manitoba Moose, affiliate of the Winnipeg Jets, the team announced. White, spent the entire 2017-18 season outside the NHL – split between the AHL’s San Diego Gulls and Iowa Wild – for the first time since his first pro season in the Montreal Canadiens’s system in 2008-09. The experienced grinder has had trouble locking down a job at all for this season, attending camp with the Minnesota Wild and then returning to Iowa, but to no avail. The owner of 313 NHL games (and 447 penalty minutes) could bring leadership and grit to Manitoba if he can prove that he can still skate at a pro level. White is the type of player who could even earn a pro-rated NHL contract late in the year with Winnipeg as fourth line depth. Only time will tell how this latest stop works out for the veteran. The Jets have recalled defenseman Tucker Poolman from Manitoba, who makes his return to the Winnipeg lineup. The 25-year-old skated in 25 games with the Jets last year in his first pro season, but failed to break camp this year. The University of North Dakota stalwart is a more than capable defender, but suffers from playing in a deep organization. Blocked by Jacob Trouba, Dustin Byfuglien, and Tyler Myers on the right side of the blue line, Poolman is not guaranteed to see the ice on this recall, but will make the most of the opportunity if he does. 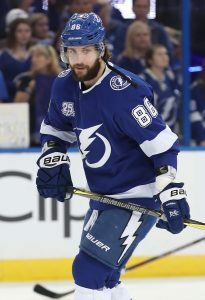 The Tampa Bay Lightning decided to go with a veteran minor league defenseman to replace Victor Hedman in the lineup for the next week until he is re-evaluated while the all-star is forced to sit out with an upper-body injury. The Lightning announced they have recalled Cameron Gaunce from Syracuse of the AHL who likely will be used as an extra defender for the team. The 28-year-old has already played eight full seasons in the AHL, while only having appeared in 32 NHL games during that span. He currently has a goal and an assist in six games with the Crunch. After 25 players were placed on waivers Friday and another seven Saturday (all of which cleared), the biggest yet came today with 35 more players being placed on waivers, according to TVA’s Renaud Lavoie. One of the more interesting players put on waivers is Reinhart, the fourth-overall pick back in 2012, who the Golden Knights took a flier on in the expansion draft. The 6-foot-4, 212-pound blueliner has never been able to match his size and skills together to make considerable NHL contributions. It was no different in Vegas, where the now 24-year-old never made an NHL appearance for the Golden Knights. He played 60 games for the AHL’s Chicago Wolves where he posted just two goals and 12 points. Budaj, who has been a solid goaltender in previous year, may be past his prime as the 36-year-old couldn’t make an impact in Tampa Bay or Los Angeles last year, both places where they had backup goaltending issues at one point in the season last year. In eight games with the Lightning last year, he posted a 3.75 GAA and a .876 save percentage. Other interesting players who saw significant NHL time last season include Andreoff, Brickley, Hayes, Dumont and Lagace. With the NHL season now just a month away, it’s time to look at what each team has done this summer and what to watch for in the year to come. Today, we focus on the Tampa Bay Lightning. Player To Watch: F Nikita Kucherov – The 25-year-old superstar quietly signed a eight-year, $76MM extension this offseason and after breaking the 100-point barrier, many wonder if Kucherov takes another step this season. He broke the 100-point barrier last year as his assist totals took a jump, most likely in part because of his success playing next to center Steven Stamkos. However, is there more that Kucherov can do to help the team capture a Stanley Cup? The winger took his game up a notch after the 2016-17 season when he jumped from 30 to 40 goals. Then last season, he took those assists up a notch, raising his assist totals from 45 to 61, while maintaining his goal-scoring prowess as he still tallied 39 goals last season. The real question is whether the 100-point performance last season is just Kucherov scratching the surface of his potential or whether he will slip back to his 80-pont ways. No matter what, he remains one of the best plaeyrs in the NHL, but one wonders how much better he can be. Key Storyline: General manager Steve Yzerman has never been shy of making a big trade to add talent for their Stanley Cup run. He did that at the trade deadline last year when the team went out and acquired two key pieces for their run when they got defenseman Ryan McDonagh and winger J.T. Miller, both who were critical to their playoff run. Unfortunately, they hit the Washington Capitals’ wall and failed to reach the Stanley Cup Finals, but they were extremely close. The team didn’t make many moves in the offseason, but were rumored to be in on a potential Erik Karlsson trade and at one point it looked like it was a done deal. However, the team may not have been ready to part with talented defenseman Mikhail Sergachev at the time. However, with Karlsson still in Ottawa, don’t be shocked if the Lightning do everything it can to bring the star defenseman aboard. If the team could find itself with a top-four of Victor Hedman, McDonagh, Karlsson and Sergachev, the team’s defense might be the best in hockey. Overall Outlook: There may be only eight teams that could be considered legitimate candidates to win the Stanley Cup this year and Tampa Bay would likely be considered among the top two or three teams this year. With their offensive success throughout their forward lines as well as a developing defense with two solid top-two defenders on the roster and the most talented young goaltender in the NHL at the moment in Andrei Vasilevskiy, the team is in good hands for the 2018-19 season. The Tampa Bay Lightning have added another option on the back end. The team has announced a one-year, two-way deal with defenseman Cameron Gaunce. Salary terms have not been disclosed, but it seems unlikely that Gaunce would secure anything above the minimum of $650K at the NHL level. The same could be said for Kevin Lynch, who also has signed a one-year, two-way contract with remain with the team. Gaunce, 28, has bounced around the minor leagues since being selected in the second round ten years ago by the Colorado Avalanche. Playing last season for the Cleveland Monsters, he collected 24 points in 67 games but failed to make it up to the Columbus Blue Jackets for any games. In Tampa, he’ll almost surely be ticketed for the Syracuse Crunch for the entire season, and asked to lend a veteran hand to their minor league squad. After a full slate of games Saturday, the NHL only has a three-game schedule on Super Bowl Sunday, the most interesting of which is the early game which matches up the Vegas Golden Knights with the Washington Capitals. With most teams having played last night, there may be quite a few roster moves made today to get ready for the new week. The New Jersey Devils announced they have assigned goaltender goaltender Ken Appleby to the Binghamton Devils and recalled goaltender Eddie Lack. Appleby was recalled back on Jan. 20 on emergency loan after backup goalie Keith Kinkaid went on injured reserve and starter Cory Schneider went down with a groin injury. Appleby played well in his three appearances as he had a 1.45 GAA and a .945 save percentage in that time. While Kinkaid has been activated, Schneider is still not skating yet. Lack, who has been injured recently, finally returned to Binghamton’s lineup and stopped 28 of 30 shots, and might be the preferred backup until Schneider returns to the team. NHL.com’s Brian Hedger writes that the Columbus Blue Jackets have assigned defenseman Cameron Gaunce to the Cleveland Monsters of the AHL after having been recalled Saturday. He did not play in last night’s game and still hasn’t made his NHL debut this season. The 27-year-old blueliner has two goals and 10 assists in 36 games for Cleveland. The assignment suggests that defenseman Ryan Murray might be ready to return for Columbus. The Pittsburgh Penguins swapped goaltenders today as the team has recalled Tristan Jarry from the Wilkes-Barre/Scranton Penguins, according to Pittsburgh Post-Gazzette’s Jason Mackey. The team also assigned Casey DeSmith to their AHL team. Jarry has played 18 games for Pittsburgh this year, backing up Matt Murray. The 22-year-old has a 2.44 GAA and a .919 save percentage. DeSmith has also fared well in just seven appearances for the NHL club. He owns a 2.24 GAA and a .926 save percentage. The New York Rangers announced that they have recalled forward Vinni Lettieri from the Hartford Wolf Pack. Lettieri was assigned to Hartford on Jan. 26. In 10 games for the Rangers, he has one goal and three assists. He has fared well in Hartford as he has 14 goals and 23 points in 35 AHL games. Lettieri should fill the roster spot for forward Jimmy Vesey, who isn’t expected to play Monday after taking a hit from Nashville’s Filip Forsberg. The Boston Bruins announced they have assigned forward Austin Czarnik to the Providence Bruins Sunday. The 25-year-old forward was recalled on emergency loan Saturday. The diminutive forward did play in last night’s game, picking up an assist in 9:07 of playing time in the Bruins 4-1 victory over the Toronto Maple Leafs. The Arizona Coyotes announced they have assigned goaltender Adin Hill to the Tucson Roadrunners Sunday. He was recalled as an emergency replacement on Friday after starter Antti Raanta was in a car accident. Raanta wasn’t hurt, but was held out for precautionary reasons. Hill didn’t see any time. He has played in three games for Arizona, but has struggled with a 3.76 GAA. The 21-year-old has fared better with Tucson as he has 2.59 in 20 appearances. NHL.com’s Alex Stepneski tweets the Dallas Stars have assigned goaltender Landon Bow to the Texas Stars of the AHL. Bow was recalled Saturday after starter Ben Bishop took a puck to the head. A concussion had been ruled out, but the team removed him for precautionary reasons. Bow’s assignment suggests Bishop will be ready for their next game. With 26 teams in action today, there will likely be plenty of roster shuffling around the league. Here’s where we’ll keep tabs on those moves. As expected, the Stars have recalled a goaltender to take Ben Bishop’s spot on the roster, summoning Landon Bow from AHL Texas, per the AHL’s transactions page. The 22-year-old has yet to play at the NHL level but has been a regular in the AHL this season, posting a 2.81 GAA with a .905 SV% in 28 appearances this season. The Blue Jackets announced (Twitter link) that they have recalled defenseman Cameron Gaunce from Cleveland of the AHL. He has two goals and ten assists in 36 minor league games so far this season and gives them some more depth with Ryan Murray still injured. The Penguins have recalled winger Zach Aston-Reese from AHL Wilkes-Barre/Scranton, per a team release. Aston-Reese was highly sought after in college free agency last season and is off to a good start to his first full professional season with 29 points (9-20-29) in 41 games. To make room for him on the roster, winger Conor Sheary has been placed on injured reserve. The Bruins announced that they have summoned winger Austin Czarnik from Providence (AHL) on an emergency basis. The diminutive forward has been very productive in the minors so far this season as he sits tied for sixth in league scoring with 42 points (13-29-42) in 38 games. The Buffalo Sabres have assigned forward Nicholas Baptiste back to the Rochester Americans of the AHL, according to NHL.com’s Joe Yerdon. The 22-year-old was called up on Jan. 19 and played four games for the Sabres. He scored his first NHL goal on that stint with a goal last week against Vancouver. He likely was sent down as the team is ready to activate defenseman Nathan Beaulieu off of injured reserve. Beaulieu has been on IR since Jan. 23.